While no horse will replace Peeping for trainer Ron Quinton, Dixie Blossoms' Angst Stakes win has gone some of the way to establishing herself as his new stable star. Quinton was devastated when Group One-winning mare Peeping died from colic in May. 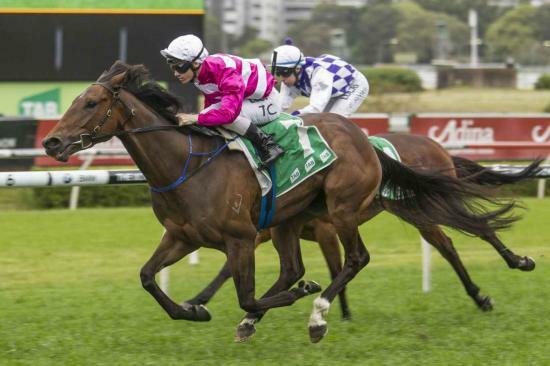 Three months on, Dixie Blossoms announced herself, coming from last to win in Saturday's Group Three over 1600m at Randwick. Quinton is ready to test Dixie Blossoms during the Melbourne spring carnival in either the Group Two Matriarch Stakes (2000m) or the Group One Myer Classic (1600m). Beyond that, Quinton plans to give Dixie Blossoms a chance to emulate Peeping's final start and win the Group One Coolmore Classic in autumn. Jockey Tim Clark weaved his way through the field in the straight to pull away for a 1-1/4 length win from Lady Le Fay ($5) with Happy Hannah ($8.50) running third. "I've never seen a young bloke so confident before the race," Quinton said. "It turned out a great ride. "It looked a bit dodgy there for a little while but he found the right gaps." The win defied a betting drift for Dixie Blossoms who went from $2.70 to $3.20. Clark said the mare was explosive when she found clear running. "Just needed the splits at the right time but when they presented she showed a great turn of foot," Clark said. "She's a pretty high-quality mare." Before Saturday Dixie Blossoms had been runner-up three times in Group races including a last-start defeat in the Group Two Golden Pendant (1400m) at Rosehill.